The Pride of Ireland Awards, which will be held for the very first time in Ireland, will air on Thursday, June 5 on TV3. Hosted by Saturday’s singer and Tipperary born Una Foden, the prestigious ceremony will celebrate heroes who have shown bravery, great kindness or even saved lives. The awards recognise and reward ordinary people who make an extraordinary difference to people’s lives. A team of researchers carefully considered every nomination and then a national panel of distinguished judges including music mogul Louis Walsh, Una Foden, MMA champ Conor McGregor and Philomena Lee, the subject of the recent BAFTA and Oscar nominated movie ‘Philomena’, were faced with the tough task of selecting the deserving winners from the shortlist. The award categories include Fundraiser of the Year, Teacher of the Year, Sporting Champion, Child of Courage, Emergency Services Hero, Outstanding Bravery Award, Local Hero of the Year, Lifetime Achievement Award and the Special Recognition Award. The celebratory awards, hosted in Dublin’s Mansion House, will be attended by Taoiseach Enda Kenny, as guest of honour along with many UK and Irish celebrities from the worlds of music, sport, TV and entertainment. 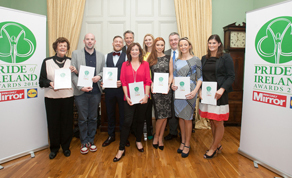 For more information on the awards, check out prideofireland.ie.